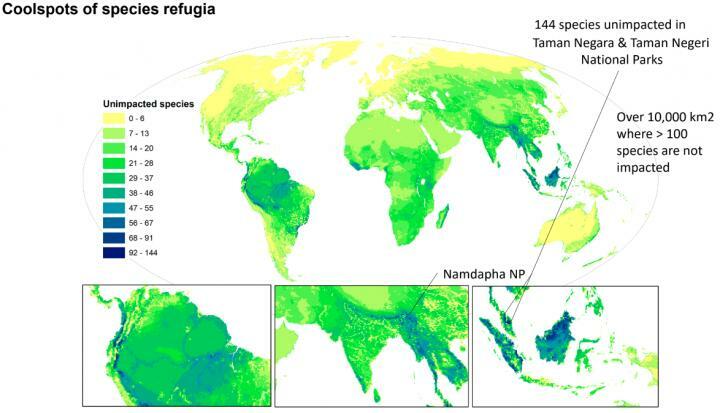 Reporting in the international journal PLOS Biology, researchers from the University of Queensland, WCS, and other groups mapped the distribution of wildlife “cool spots” where wildlife is still thriving, along with “hot spots” where species richness is threatened by human activities. Of the 5,457 total species, 2060 are amphibians, 2120 are birds, and 1,277 are mammals. Human impacts on these species extend across 84 percent of the Earth’s terrestrial surface, and many charismatic species including lions and elephants are impacted across the vast majority of their ranges. Some of the “cool spots” identified include parts of the Amazon rainforest, Andes Mountains, and tundra and boreal forests of Russia and North America. Top “hot spots” were dominated by areas in Southeast Asia where wildlife-rich tropical forests are increasingly threatened by expanding human impacts.